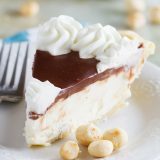 Almost no-bake, this White Chocolate Macadamia Pie is super easy and perfect for white chocolate lovers. Beat the cream cheese with the sugar until smooth. Add in the 1/3 cup cream and beat to combine. Add the white chocolate, orange zest and macadamia nuts and stir in with a spatula just until combined. Gently fold in the whipped cream. Spread the mixture into the baked pie crust. Freeze until solid, about 4 hours. About an hour before serving, make the ganache. Place the chocolate chips in a bowl and set aside. Heat the cream over medium heat until simmering. Pour the simmering cream over the chocolate chips and stir until completely melted. Let the ganache cool slightly. Spread the ganache over the top of the frozen pie, smoothing the chocolate to the edges with an offset spatula. Pipe the sweetened whipped cream onto the pie and then sprinkle with the macadamia nuts. Refrigerate the pie until ready to serve. Total time does not include chilling/freezing time. You’ll want to make sure you have about an hour for the ganache to set up and for the pie to thaw out before serving, so make sure you add the ganache no less than an hour before serving.